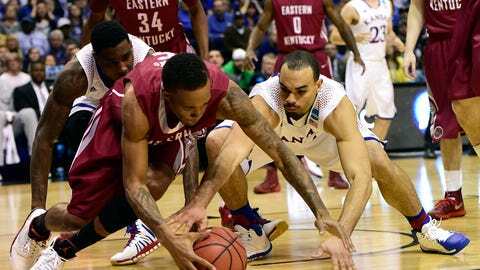 Conner Frankamp (23) is in the background of this photo (that's KU's Perry Ellis scrambling for the ball), and he was even more out of sight for the Jayhawks before Bill Self turned to him Friday afternoon. ST. LOUIS — His first NCAA Tournament game in the books, Kansas star freshman Andrew Wiggins strolled through the postgame handshake line with all the excitement of a walk to class. He admitted to feeling butterflies before tipoff, but you couldn’t tell — when can you? — as he scored a game-high 19 points in an 80-69 victory over pesky Eastern Kentucky on Friday afternoon. "I was nervous, but it wasn’t crazy nervous," Wiggins said. When was the last time you were crazy nervous? "My first college game," he said. "But once the jump ball happens, it’s all gone. It’s just a game." The rest of the Jayhawks took a little longer to shake a case of turnover jitters and to acclimate to the Colonels’ harassing defense. After the first five minutes, the Jayhawks had five turnovers to go with only six points and they found themselves trailing by seven. That’s when coach Bill Self turned to another freshman, one who hasn’t seen many minutes this season but would make a greater impact on this victory than his more celebrated teammate. Conner Frankamp had not played more than 15 minutes since Kansas’ season opener but, for 25 minutes on the stage of March Madness, he performed with a control like he’d been playing as much as Wiggins all season. "I am not sure if we win the game without him," Self said. "He is a calming influence, and it is probably not a coincidence our team may have had two or three turnovers total when he was in the game." The coach was not far off. Kansas finished with 14 turnovers, but all but two came in the first 13 minutes. With Frankamp taking control of the offense, forwards Jamari Traylor, Perry Ellis and Tarik Black had their way inside against a front line with only one player taller than 6-foot-5. The three, all of whom go at least 6-8, combined for 43 points on 19-of-25 shooting. "I just try to get in there and feed the ball to whoever is open as best I can," Frankamp said. "Just try not to make any turnovers when I was out there." Though Frankamp had trouble getting off the bench this season, he did not arrive in Lawrence unheralded. He was a top-50 recruit out of Wichita North High School, where he broke the City League scoring record that had been held by Ellis. Listed at 6-0, 165, Frankamp isn’t exactly intimidating, either. Still, his teammates said they weren’t surprised with his heady play against Eastern Kentucky. "He’s been giving us problems in practice all year," Black said. "Once he got in the flow of the game, his talent took over. You got to see what he’s capable of today." Self had a feeling coming in that he might need Frankamp’s cool hand against the Colonels, who set their defense farther from the basket than the Jayhawks are accustomed to. Self even told his coaches Thursday that Frankamp would get a shot. Before tipoff, he gave Frankamp a heads-up. "I told Conner before the game I am going to go with you," Self said. "And I really haven’t given him a chance to play. But he’s gotten better throughout the year and he deserves an opportunity. Sometimes situations maybe didn’t play out the way that he got the opportunity. But he just tries to get better. He is a tough kid and has hung in there." Once Frankamp entered with 14:23 in the first half, after two turnovers by starting point guard Naadir Tharpe, he didn’t take long to get in the flow. He made his first jumper and got his first assist — on a dunk by Wiggins — in his first two minutes. He played all but about two minutes the rest of the first half and, after entering the second half with 12:14 left, he did not come out. "When he was in the game the majority of the time, we only had one primary handler and that was him," Self said. "So there is a lot of pressure on Conner to be a calming influence for us, and certainly he was. I thought he handled everything beautifully." Added Wiggins who, for once, might not have been the coolest freshman on the floor: "He came in and saved the day for us."